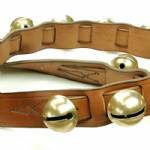 This laced bell strap holds 20 "round ridge" bells, 1 3/8" diameter. The bells date to the late 1800s and early 1900s. The bells were cleaned, polished, and lacquered. The medium brown straps are laced together. Decorative stitching fastens the ends of the bell strap to the wider lining strap. The finished piece is 1 1/2" wide and 60 inches long from buckle to tip. The solid brass buckle was reused from the original strap.